Today Apple released the first the first public beta of Safari 4. As a very curious person I, naturally, had to already give it a try :-) Since I’m still using Webkit in the background, I can’t really say anything about the version of the rendering engine; so I will focus on the GUI changes here. So far I really like it. Sure there are a few smaller issues and tons of stuff that I have to get used to, but overall Safari 4 looks like a good evolution. The first thing you will see in the new GUI is the so-called “Top Sites” page. If you’ve used Opera recently (within the last 2 years) you will probably already know something quite similar with “Speed Dial” from there. 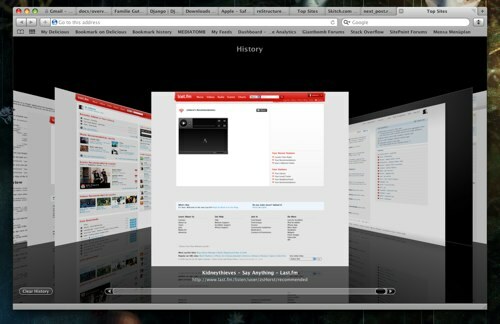 The difference is, that Safari tries to give you the sites you’ve visited most recently. If you like a site to stay on that view, you have to explicitly mark it as sticky. Nice tough and thanks to it having its own shortcut (cmd+shift+1) I can definitely see myself using it a lot in the future. Just one thing, though: Please, Apple, add some keyboard navigation there. One of the really great new features of Firefox 3 is its addressbar which acts also as kind of a search helper for previously visited pages simply by not only matching the prefix of a URL but more or less arbitrary substrings in the URL as well as in the title of a page. Sadly Safari 4’s so-called “Smart Address Field” doesn’t go that far but limits its search on the URL part. 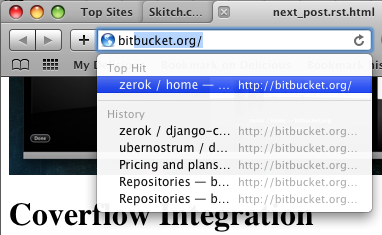 But at least it now gives you also the title last seen with the URL you’re typing. The new address field now also includes the Refresh/Stop button which was previously available is its own button. I’m not so sure if this doesn’t really push the whole “compact layout” idea a bit too far, though. 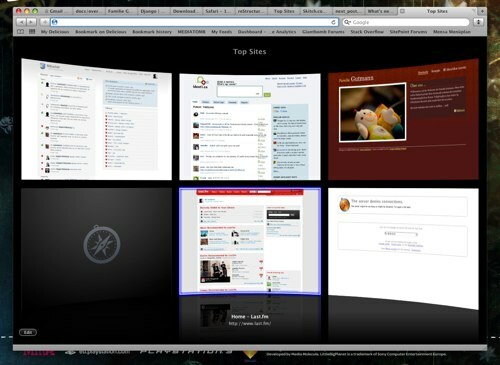 So far I really like Safari 4. Some features not mentioned here I’m still trying to get used to. Esp. the new position of the tabs is a nice feature for people like me who are often working on their MacBooks on the go and need every pixel of screen-estate they can get, but it’s still quite a change (yet I really want to see that integrated into Terminal.app).